There is no doubt about it - yoga is good for your health. In fact, the Mayo Clinic reports that participation in a regular yoga routine can reduce stress, improve fitness level, and lower the risk of certain chronic health conditions. But it is the right choice for individuals who are interested in burning calories and cutting unwanted pounds? Depending on the style, yoga may, in fact, be helpful when it comes to shedding body weight. Designed to improve general health and obtain a deeper stretch, Bikram yoga is performed in a room that has been heated to 105 degrees Fahrenheit. According to Bikram Yoga Leeds, a general Bikram yoga routine contains 26 yoga poses, and two specific breathing routines. How Many Calories Are Burned Doing Yoga Sculpt? While QuickFit Yoga's calorie calculator suggests that a 150-pound yogi who participates in a 90-minute Bikram yoga session may burn as many as 1021 calories, this may be a significant overestimation. In fact, Colorado Public Radio reports that a study done by Brian Tracy, a professor in the Health and Exercise Science Department at Colorado State University, found that women and men burned only 330 and 460 calories, respectively, in a 90-minute session. Overestimations of caloric burn may have occurred due to failure to factor in the higher temperatures in the room, notes Tracy. Vinyasa yoga - or breath-synchronized movement, as it is sometimes called - is a series of yoga poses performed in combination with deep inhalations and exhalations. Surya Yoga says Vinyasa yoga is performed smoothly, and is designed to remove toxins, and promote relaxation and re-energization. According to Yoga Accesories, a 150-pound yogi burns an estimated 891 calories in a typical 90-minute yoga session. Hatha yoga contains a series of poses - or asanas - designed to align the skin, muscles and bones. Yoga Journal notes that, when performed properly, Hatha yoga can be helpful when it comes to promoting the free flow of energy in the body. As it is "gentler" in nature, it should come as no surprise that Hatha yoga is fairly low on the calorie-burn scale. In fact, Yoga Accessories reports that a 150-pound yogi will only burn about 284 calories during a typical hatha yoga session. As suggested by the name, power yoga is a high-intensity style of yoga designed for yogis interested in a more active and athletic class. 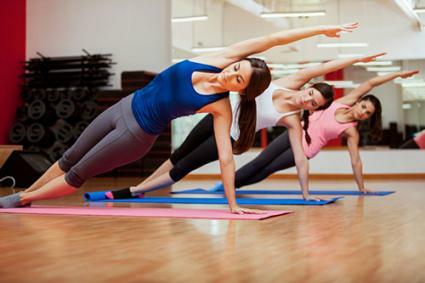 Women's Health Magazine reports that power yoga does not follow a specific pattern, and instead, the selection of poses may vary from class to class, depending on the instructor. A 150-pound yogi can expect to burn around 714 calories in a 90-minute power yoga class. It is important to note that when it comes to yoga, gender does little to affect caloric expenditure - a 150-pound man will burn the same number of calories as a 150-pound woman in the same time period, reports Beth Shaw in "Yoga Fit" (page 17). Instead, differences arise more commonly with variations in experience level. A beginning-level yogi, for example, will likely perform easier yoga poses at a slower pace, as compared to their more advanced counterparts. Shaw reports that as yoga experience level increases, more challenging poses can be incorporated and performed at a more rapid pace, thus increasing caloric burn during the yoga session. Yoga is an effective form of exercise for those who are interested in promoting flexibility and improved musculoskeletal health. Individuals who want to lose a few pounds may fare well by choosing a vigorous style of yoga and performing it at a brisk pace. As experience level increases, yogis may find that they are able to perform more challenging poses, which will also be effective when it comes to increasing calorie burn.